The beginning of 1394 according to the Persian calendar, still haftsin (Nowruz-set tables) enlivening restaurants and hotel halls all over the country, marked my third trip to the Islamic Republic. The first few days of this recent trip I stayed in Tehran to finally tour around the capital, and my wanderings brought me to the opulent and extravagant mansions where the Pahlavi family liked to boast their wealth. While walking along the beautiful tree-lined boulevard leading to the Green Palace, I stumbled on a greatly gifted disabled painter whose nature-filled paintings caught my attention straight away. I was choosing which painting to buy and when I was finally about to grab mine, a guy arrived and literally snatched it from under my nose. No problem, I said, I’ll take another one. As he didn’t have any ready, he told me that by the time I would go visit the palace and come back, the painting would be finished. We set the deal, I did my sightseeing, came back and the painting was ready. “It will dry in one day!” he told me. Ten days, three cities and three provinces later, the painting was still wet. This, I reckon, is the perfect prelude to what I like to call the unconventional adventures of an Italian in Iran. 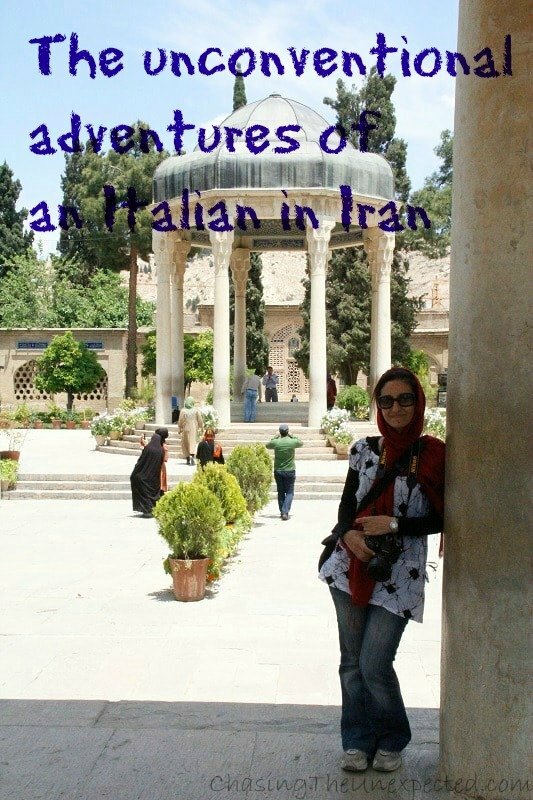 The Italian would be me, and my adventures are likely to make you understand why I go to Iran so often. 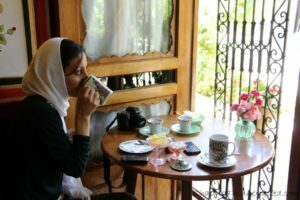 I’ve written about the glorious history of ancient Persia, the mesmerizing Islamic art, kaleidoscopic mosques and Zoroastrian fire, romance and poetry Iranian style, my favorite dish and also my favorite cafes (well, not all of them), but let’s face it, with already three Iran trips on my resume (and counting), could my expeditions be always serious and research-oriented? As it happens, they were actually quite the opposite. Traveling is always an unlimited source of quirky events, and, as it turned out, roaming around Iran’s different provinces offers such a bottomless supply of bizarre and worth-remembering experiences that taken all together make for the perfect adventures of an Italian in Iran! I think I’ve mentioned here and there throughout my posts on Iran that I was constantly mistaken for a local (by the mayor of Tehran’s Municipality 6, too, nonetheless! ), and this was probably root cause of many funny and also awkward situations, of which, some of my very favorites are related to the wonderful world of ta’arof. I might have mentioned this, too, but not thoroughly as it deserves. As explained on the website Dream of Iran, taarof is Persian incredibly elaborate courtesy policy. These polite manners are usually kept among Iranians, but since nobody could spot I wasn’t a local, I fell victim more than once. Quite proudly, I must say. When it comes to payments, for example, taxis or stores, the receiver usually refuses the money saying something of the likes “you don’t need to pay! you’ll pay me next year!” This is why they don’t do it with tourists, simply to avoid the risk of seeing them leave really without paying, while Iranians know they need to keep thanking and insisting until the interlocutor finally accepts the money. The first time I got “taarofed” was in Lahijan, in the northern province of Gilan. I wanted to buy a manteau, one of those long-ish dresses women have to wear according to the Islamic Republic dress code, and after trying a couple of different colors and models, I finally chose mine. When I was going to pay, the lady, who clearly understood I was a foreigner, couldn’t resist and left me with a glittering “May your flowery hands not be too sore” [for giving her the money]. That, as a first taarof experience, went pretty smoothly, definitely more than the second one. I was shopping (again) for a pair of jeans, and I found them in central Tehran. After trying them out, overcoming the decision process and paying, I needed them to be shortened. Fortunately enough, the shop had their own tailor in-house. I brought them to him and in ten minutes sharp the job was done. He hadn’t heard me talk so, not understanding I wasn’t Iranian, at the moment of paying him, the inevitable taarof scene started with the awkward moments of me lending the money, him not accepting it and slightly swinging his head in disapproval, me forgetting for a moment about taarof and trying to get my jeans back, him refusing to release my trousers, me looking puzzled on what to do, him desperately waiting for the right answer from my part so he could finally get the money and, in all this, my friend Madi, the Iranian one of our traveling duo, giggling shamelessly and quite enjoying the catch-22 situation I had gotten myself into. Naturally, being taarofed and mistaken for a local were not the only ingredients that made my Iranian adventures somehow unconventional. Let’s say that these are just tasty starters. During my recent trip, I took the bus from Esfahan to Yazd and the team in charge (not sure why there is always a whole team on Iranian buses, instead of just a driver) allowed my friend and I to sit in the front since the two seats were empty (they later regretted their choice, but that can maybe be a topic for the next post about my feats in the Islamic Republic or for when I’ll write a book about it!). As history goes, behind me was sitting a friendly and chatty woman who, as soon as she learned I was a foreigner, decided I was a perfect fit for her son. It didn’t matter that he was a college student and I was some 10+ years older, the leitmotif of my bus trip immediately became getting married to a 23-year-old student: if I wanted we could talk over the phone straight away, if I wanted he could even come pick us up at the bus station, if I wanted we could even go to dinner as soon as we arrived. If I only wanted! Just say the word and he would have arrived. Thankfully, I somehow managed to convince her that her certainly great son was too young and needed to enjoy his student life. The simple act of traveling is already an adventure, but when you happen in countries that by nature are colorful both in landscape and society, it goes without saying that your trip will be memorable. Jumping on and off airplanes, extra urban coaches, taxis where our suitcases never fit, and regularly recollecting myself after being prompted to fix my hijab (“Mind your hijab!” was just one of the recurring friendly reminders) constitute the picturesque sidebar of my Iranian adventures, an amusing corollary without which tours and sightseeing, in the long run, can become just something to tick off your bucket list. To me, colorful is what best defines Iranian society and folklore, so much that my ongoing adventures in the Islamic Republic are likely to be the main subject of a future book! 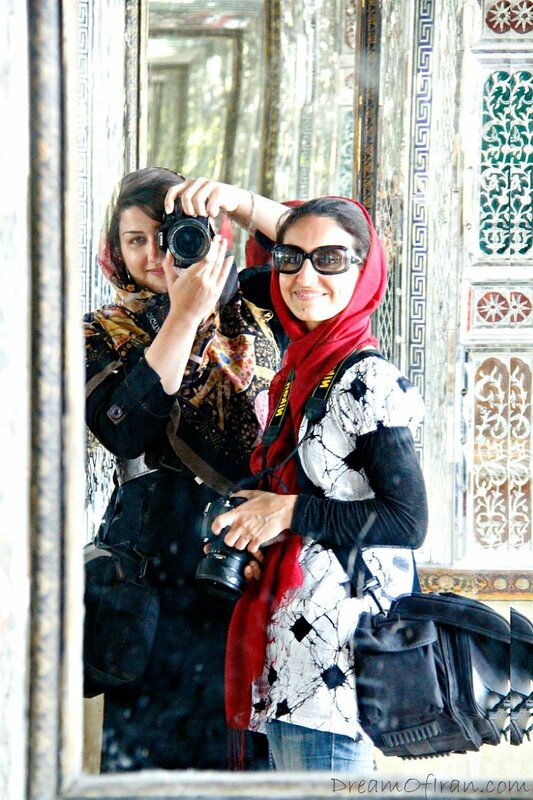 Is Iran safe for women travelers? Iran is the best country to visit and enjoy and the best kept secret. The most hospitable and friendly people you will ever meet and the most amazing sites and food to eat.